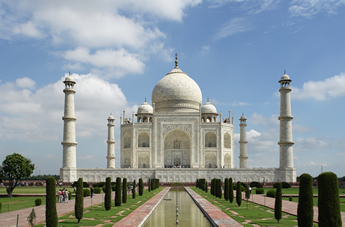 An all-inclusive, 13-day adventure featuring India's famed Golden Triangle and a 7-day luxury cruise along the lower Ganges River. 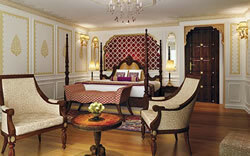 Explore splendorsof Delhi, West Bengal, Jaipur and the Taj Mahal in Agra. Enjoy free-flowing beverages onboard,including house wine, locally produced beer & spirits. 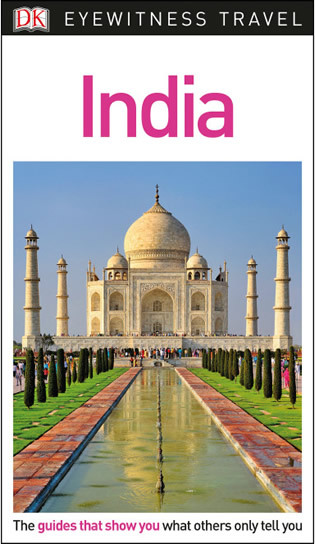 We invite you to join Brand g Vacations from September 30October 12, 2019 for an inclusive, all lgbt, 13-day journey, exploring the splendors of India and cruising the Lower Ganges River. During the river cruise, you'll return home each night to a soothing atmosphere of relaxation aboard the elegant, all-suite Ganges Voyager. Breathe in the scenery from the comfort of a top deck lounge. Explore the healing sensations of Ayurvedic or traditional European spa treatments. Gather with your new friends and discuss the meaning of enlightenment as you watch the world go by. No matter where you are on board, you'll feel a renewing energy and comforting sense of peace. 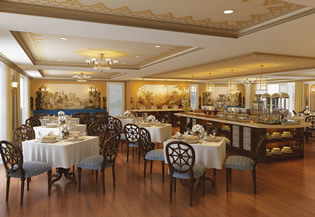 As a guest of Brand g Vacations you'll also enjoy free flowing beverages and your choice of European cuisine and regional specialties infused with flavors from India's celebrated culinary tradition. With just 28 custom-designed suites, space is limited, so contact us and book your cruise-tour today! Fantastic rates starting at just $6,599! Brand g Vacations has chartered the 28 suite RV Ganges Voyager. 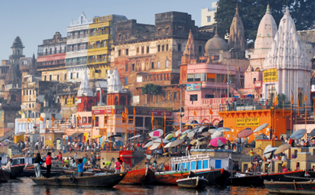 Whether you are an experienced river cruiser, or this is your maiden voyage, Brand g invites you to explore India and the lower Ganges River — a magical destination full of mystery, enchantment, and beauty in every direction. 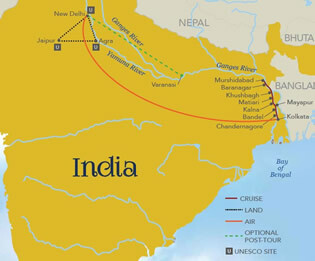 Explore the historic cities and villages of the Ganges delta along the holy river known as the Mother Ganga. • Complimentary coffee, water, tea soft drinks, select free-flow house wines for dinner, and locally produced spirits and beer. 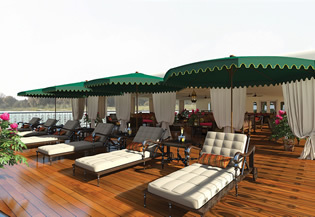 Accommodations aboard the Ganges Voyager embody the grace and style of the British colonial era, incorporating modern conveniences and luxuries that rival the finest hotels of Asia. Spacious, well-appointed suites include daily housekeeping and turndown service, fine bed linens, premium mattresses and duvets, your choice of pillows, flat-screen televisions with on-demand movies, international newspapers, individual climate control, as well as spa quality robes, slippers, and bath amenities. 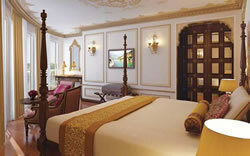 Arrive at the Delhi airport where you will be met by a Brand g representative and transferred to your hotel for two nights in an Imperial room, at the deluxe Imperial Hotel New Delhi. Meet your fellow travelers at an evening welcome reception at the hotel. 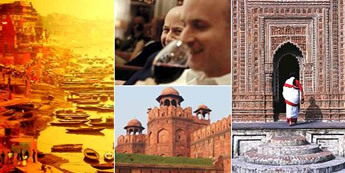 After the welcome briefing, the comprehensive tour introduces you to the bustling city's landmarks, passing the imposing Red Fort, President's Palace and City Gate, and discovering the narrow lanes of Old Delhi via a rickshaw ride. Visit Raj Ghat, the memorial to Mahatma Gandhi, Humayun's Tomb, a 16th century landmark of Mughal architecture inscribed on the UNESCO World Heritage list, and Qutab Minar, also a UNESCO site. This evening, join your fellow travelers for dinner at the hotel. Enjoy breakfast at the hotel before transferring to the airport for your short flight to Kolkata where upon arrival we transfer to the ship. After settling into your suite aboard the Ganges Voyager, we’ll gather for a welcome reception and dinner, followed by a musical performance featuring songs of the Bengal region. This morning, we'll go ashore to explore the legacy of Kolkata's British colonial era. 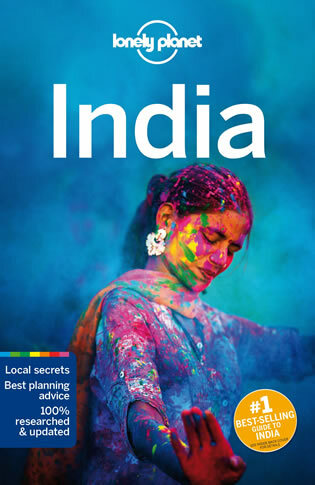 We'll see the Writers' Building, General Post Office, High Court, Raj Bhawan (Governor's House), Town Hall, Council House, Treasury Building, Reserve Bank of India, as well as Dalhousie Square. We'll enjoy a tour of St. John's Church, which was built in 1756 by Lt. Colonel James Agg and houses India's oldest functioning pipe organ as well as a painting of the Last Supper by German artist Johann Zoffany. As we stroll the grounds, we'll see several tombs of British Generals who lost their lives during the Siege of Kolkata in 1756 by Nawab Shriaj Ud Daula. Finally, we'll visit the impressive Victoria Memorial Museum before returning to the Ganges Voyager for lunch and the start of our journey upstream. This afternoon, we'll board our excursion boats and go ashore at Bandel, a port founded by Portuguese settlers in the 1800s. Our visit includes a tour of the Hooghly Imambara (completed in 1861), an important Shia pilgrimage center with a clock- tower lookout that boasts views of the Ganges. The structure contains a working clock with a winding key weighing approximately 20 kilograms (44 pounds). Inside the main building, large Persian chandeliers and smaller lamps light the main prayer hall where text from the Quran is engraved in the walls. 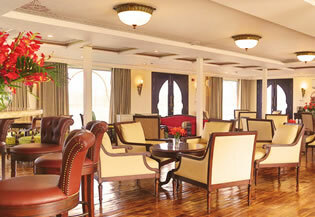 After our visit, we'll return to the ship for dinner in the East India Dining Room. This morning we enjoy a rickshaw ride through the city center of Kalna en route to the enchanting Rajbari complex, with the highest concentration of temples in the region. Bengal’s mixture of temple architecture includes the Nabakailas Temples. Built in 1809 by the Bardhaman Maharaja, the complex contains 108 eight slope-­-roofed temples – 74 in the outer circle here and another 34 making an inner circle. Another complex features diverse architecture, including the Pratapeshwar Temple, built in 1849. Terra cotta plaques depict themes of Hindu epics, mythical life of Sree Chaitanya, images of Durga, and various aspects of day-­-to-­-day life in the region. Other temples on the site include Lalji Temple, the oldest in the complex (1739), and Krishnachandra Temple (1751). This morning you may enjoy a shore side bazaar. Matiari is known for manufacturing beautiful handcrafted brass items, utilizing traditional methods passed down for generations. These master craftsmen utilize recycled copper to create exquisite pots, platters and more from their workshops in the village. We then continue our journey upstream. We sail past the battlefield of Plassey, where Robert Clive of British East India Company defeated the Mogul Nawabs in 1757. The rulers of Bengal and their French allies established the company rule in India, which spread through much of South Asia for the next 190 years. This morning we visit the charming village of Khushbagh, passing through scenic fields to arrive to the wel-preserved mosque complex built by Nawab Ali-Wardi-Khan, housing his family’s private mosque. His grandson Siraj-ud-Daula was defeated by the British East India Company at the Battle of Plassey in 1757. After an on-­-board breakfast and morning sail, we visit the village of Baranagar. A lovely example of life in rural India, this village is home to several temples dating from the 18th century (1714 – 1793). Built by Rani (Queen) Bhabani, the landlady of Natore. The brick temples are considered to be among the best examples of Bengal terra cotta art. We then return to the ship for lunch and sail downstream. This afternoon we pass by charming countryside villages filled where locals greet us from the banks. We approach Murshidabad, a hidden architectural gem along the Ganges with dramatic whitewashed colonial era structures. We visit the Hazarduari Palace, built during the reign of Nawab Nazim Humayun Jah (1824 –1838 AD) by an English architect, McLeod Duncan, in the Greek “Doric” style. The palace has more than a thousand real and false doors in the vast corridors, and is filled with colonial era antiques, artwork and manuscripts. Opposite to the Palace is a vast Imambara – built by the Nawab for worship. We then take a scenic ride by local buggy to the Katra mosque. Built by the first Nawab of Murshidabad –Murshid Quli Khan in the 1724 – 25, this mosque has distinctive minarets from which the muezzin calls the faithful to Friday prayers. This evening we return for dinner and local cultural performance on-board. After a restful morning, observing the local life along the riverbanks, we stop in the village of Mayapur. Known as the birthplace of Sri Chaitanya Mahaprabhu (1486) and considered an incarnation of Lord Krishna, this is the home of the Krishna Consciousness Movement also called ISKON. Guests can experience the fascinating culture of these followers and their ornate, colorful decorated statues of Krishna. Additionally, we will learn from Krishna followers leading the construction of the new temple located on the complex, due to be completed in 2016 during their Jubilee year. The new temple can be compared to the Vatican, and contains a 700,000 square-foot temple, measuring 340 feet high with a 75- foot domed planetarium. American Alfred B. Ford, the great grandson of Henry Ford, has funded more than 50% of the project. We begin the day in Chandernagore, established as a French colony in 1673. The French obtained permission from Ibrahim Khan, the then Nawab of Bengal to establish a trading post on the riverbanks of this city, which became a permanent French settlement in 1688. We will explore the French colonial buildings along the promenade, including the former French governor’s residence (now converted to a museum that features an exhibition of items that depict life during this period). We then will visit the Sacred Heart Church of Chandernagore. 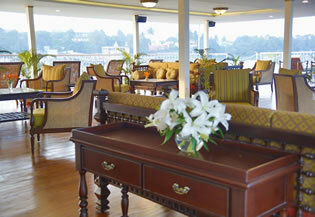 We then return to the ship and continue our journey downstream to Kolkata. Following breakfast we disembark the vessel with packed lunch and transfer to the Kolkata Airport en route visiting Mother Teresa’s House and Orphanage. Mother Teresa started the Missionary of Charity in 1952, then lived and worked here until her death in 1997. The permanent exhibition includes a visit to her personal room, we learn her life story, and see her charity that is still active. We continue by foot a short distance to her orphanage, Sishu Bhawan (Children’s Home), where one of the sisters will lead us on a tour. Thereafter we transfer to the airport for our short flight to the capital of Rajasthan, Jaipur. 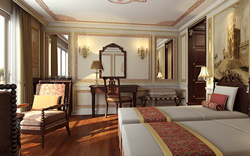 Upon arrival we transfer to the magnificent Rambagh Palace Hotel where you’ll check into your Palace Room for an evening of relaxation, including dinner in the hotel’s opulent ballroom. Enjoy the opulent breakfast at the hotel this morning and join today’s tour of the “Pink City” featuring an optional elephant back ride up the hill to the Amber Fort, the former seat of the Rajput rulers of Jaipur. Visit the UNESCO-designated site of the Jantar Mantar Observatory and the residence of the former royal family City Palace, a complex of lovely courtyards and gardens. Dinner is on your own tonight to explore northern India cuisine. Today’s scenic ride takes you to the city of Agra, located on the banks of the river Yamuna in the northern state of Uttar Pradesh. 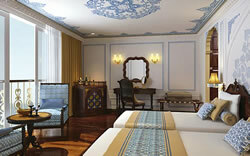 Check in to your Mughal Chambers room at the ITC Mughal Hotel for one night. This afternoon, we visit the massive and impressive Agra Fort, a red sandstone stone walled complex of palatial buildings. Afterwards we transfer to Mehtab Bagh park for an unforgettable sunset view of the Taj Mahal from across the Yamuna River. Early risers may join the captivating sunrise tour of the Taj Mahal for an inside visit of the UNESCO site. Enjoy breakfast and some time at leisure at your beautiful hotel this morning, or take the opportunity to shop for keepsakes. 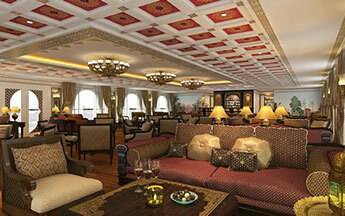 After lunch, a scenic ride takes you to New Delhi for the rest of the day at leisure. Day room use in a Superior room at the deluxe Radisson Blu Plaza (until 10pm), refresh and relax before your transfer to the airport for your late evening or early morning international flight. Or, spend the night and join the post trip add on to Varanasi the next morning. 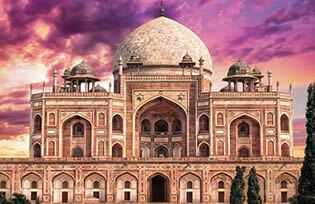 • Visit the UNESCO World Heritage Sites of Humayun's Tomb and Qutab Minar. • Go inside the walls of the ancient Mughal capital of Old Delhi to see the Jama Mashid Mosque and Raj Ghat, the memorial to Mahatma Gandhi. • Board an excursion boat for a tour of the Hooghly Imambara in the port of Bandel. • See the mosque of Nawab Ali-Wardi- Khan in Khushbagh and the Rani Bhabani temples in Baranagar. • Tour the Hazarduari Palace in Murshidabad and visit the Katra Mosque. • See the new Temple of the Vedic Planetarium in Mayapur. • Visit the Sacred heart Church. 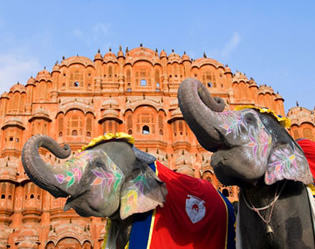 • See Rajasthan's fabled pink city of Jaipur, Agra Fort, and the legendary Taj Mahal. Complete your exciting journey with a visit to captivating Varanasi. Overnight in Delhi on October 12th and on October 13th transfer to the New Delhi airport for your flight to the holy city of Varanasi and one night in a Business Class room at the Radisson Hotel Varanasi . Witness the mesmerizing Aarti Ceremony attended by hundreds of worshipers, from your private boat on the Ganges River. The next morning, discover the early, daily rituals performed along the Ganges during an unforgettable private sunrise cruise. Later, fly to Delhi (expected arrival to Delhi at 4:30pm) for some time at leisure and day room use until 10pm in a Superior room at the deluxe Radisson Blu Plaza Delhi Hotel before your late evening or early morning international flight. Price and hotel properties are subject to change. On land, attire is club casual. Aboard the Ganges Voyager, attire is casual and comfortable during the day, with resort-style clothing, and comfortable, but sturdy, footwear for excursions. Evening wear consists of open-neck shirts, trousers, skirt, or similar attire. Footwear is always required in all public areas, and when navigating stairs on board. The official currency on board the Ganges Voyager is the Indian rupee. During the cruise, we operate on a cashless system, with all purchases billed to your onboard account. At the end of the cruise, bills may be settled in cash with Indian rupees or by credit card with Visa or MasterCard. The Ganges Voyager does not provide a currency exchange service, nor is there an ATM on board. In Delhi, Kolkata, Jaipur, and Agra, you will find options for obtaining rupees at both Indian and international banks, ATMs, and wire services. Our culinary team will make every effort to accommodate special dietary requests. Please inform our office at least 60 days prior to departure of these requests. The voltage in India is officially 220/50Hz. To use any electrical product from the US that is not dual voltage, you will need an electrical converter. The Ganges Voyager has multi-configuration outlets, which accommodate most Western plugs. We recommend bringing an adapter for use in the hotels. Because the voltage may fluctuate at times, we also recommend unplugging your devices when not in use or when leaving them unattended. While you can expect to encounter insects during your trip, most are relatively harmless. Switching off lights when exiting your room or suite, and ensuring that glass or screen doors or windows are closed at all times will minimize the number of insects allowed into your room. On the fast-moving river, mosquitoes are rarely seen while sailing. If planning to be outside in the early morning or evening hours, applying an insect repellent to exposed skin is recommended. All shore excursions during your 15-day travel program. Excursions are led by expert guides, and guests are divided into three groups, guaranteeing there are never more than 12 passengers touring together. Electronic listening devices are complimentary to all guests in order to ensure that guests are able to hear their guides, without disturbing nearby wildlife. The comfort and safety of our guests is our first priority. Smoking is not permitted in the suites or enclosed, public areas on board. There is a designated smoking area on the Sun Deck. Only guests who possess tickets for passage are allowed on board. Security services are provided on board to ensure everyone’s safety throughout the journey. Gratuities are customary expressions of appreciation for a job well done. It is our goal to ensure that the service you receive is as wonderful as the sites you visit. Gratuities for the included portions of this program have been pre-paid. At your own discretion you may choose to provide additional tips. Please do not drink the tap water while on board or on shore, or use it for brushing your teeth. The ship’s water supply comes from the river after passing through a sterilization process. This water is suitable for showers and baths, but should not be consumed. Complimentary bottled water for drinking and brushing teeth is provided on board, as well as during excursions. To save water and reduce detergent use, we will only change towels if they are placed on the floor. A passport, which is valid for six months after your last date of travel, is required for this trip. Visa Requirements – citizens of almost every country require tourist visas to enter India. • If you have made other independent arrangements which require multiple entries into India, check with your nearest Indian consulate for the appropriate visa application process. Use care to be sure you are accessing information from the official consulate and not an intermediary. • If you prefer you may also use a visa service to assist you with obtaining your visa. US citizens should consult the Centers for Disease Control website, or your health care provider for vaccination requirements and recommendations. Citizens of all other countries should consult their government’s national disease center or their physician. 400 square feet, Panoramic French Balcony, Fixed King Bed, Butler Service, Complimentary One-Hour Spa Treatment Per Guest, Laundry Service, Bottle of Wine Upon Embarkation, Evening Canapes. 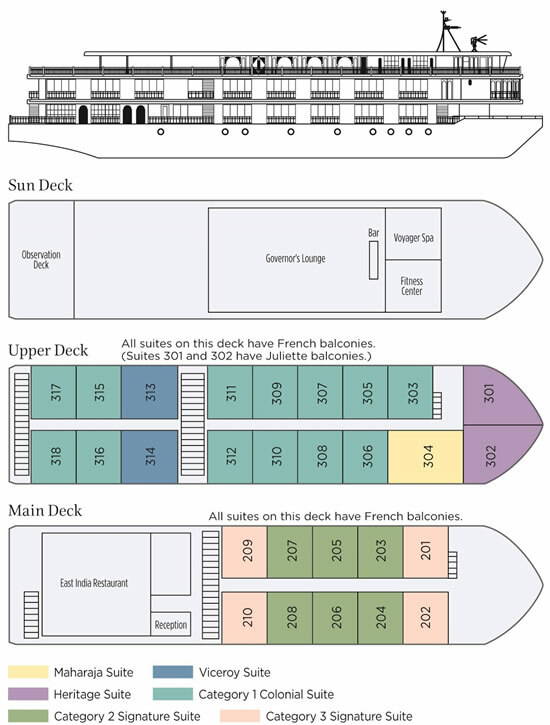 360 square feet, French Balcony, Fixed King Bed, Butler Service, Complimentary One-Hour Spa Treatment Per Guest, Laundry Service, Bottle of Wine Upon Embarkation, Evening Canapes. 280 square feet, French Balcony, fixed queen bed. 261 square feet, French Balcony, two twin-sized beds that can be converted to one queen-sized bed. The fares above are per person USD, based on double occupancy. Initial deposit is $850 person, with final payment due June 3, 2019. Cruise Port Charges of $199 per person are additional. 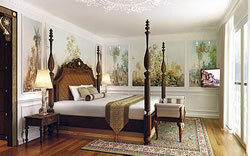 Pre-paid Gratuities of $250 per person are additional. International airfare is not included. Single Supplement is $2,500 of twin price, for Signature and Colonial Suites. All reservations are subject to Brand g's Terms and Conditions.